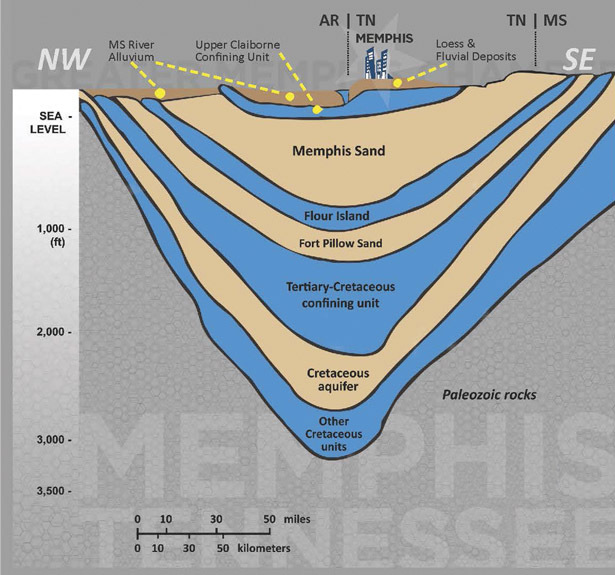 According to Larry Jensen, Memphis water is a gift. Jensen, President and CEO of Commercial Advisors, LLC, has become a champion of what he said is probably “the sweetest and softest water in the world.” It’s also plentiful, a status not universally enjoyed as anyone in the drought-stricken Western U.S. will tell you. It boils down, Jensen says, to three essentials: quantity, quality and cost. And each one of those elements is very nearly unrivaled, which means when you take a sip, you’re tasting some refreshing economic development. As for quality, the water is naturally filtered through clay and sand. When taken from some 250 wells in the area it’s aerated to eliminate some iron and dissolved gases. “Basically, it’s getting oxygen into the water,” Collins said. And then there’s filtration which, he said, “just takes iron out of the water.” Finally, it’s treated with minimum levels of chlorine and fluoride as mandated by the EPA. The cost is reflected in that industrial utility customers have the lowest water bill in the nation. “Many cities have water prices for the same amount of water that are two to three times higher than what our citizens pay,” Collins said. That’s a triple whammy when it comes to showing businesses, from restaurants to manufacturing plants, that Memphis is the place to be. Herbison said the Chamber is increasingly focusing on the purity of the water in Memphis. Companies elsewhere, he said, “spend a lot of money to get purity of water—it can mean millions of dollars a year in chemicals and equipment.” The Chamber, he said, is working with a consultant to develop information specific to various sectors in manufacturing, such as electronics, food, heavy industry and refineries. The data will provide answers to companies who are concerned about availability, purity and costs of water. And it’s highly likely that Memphis will emerge looking mighty good. Memphis Light Gas and Water’s Sheahan Station is one of several huge pumping facilities that keep Memphis Sands Aquifer water flowing through city pipes. The big question that looms over all of this: is Greater Memphis taking care of its golden goose? While the amount of water in the aquifers is known and the amount coming out is known, it’s not clear what the rate of replenishment is. That question is being addressed by the new Blue Stream Task Force established by the City of Memphis. Some 50 representatives of business, government and nonprofits will figure out how best to move ahead.